County Louth or 'The Wee County' is the smallest county in Ireland. It was originally part of the province of Meath, which was then broken up into the counties of Meath, Westmeath and Louth (and maybe some others) to form part of the province of Leinster. Louth stands at the northern boundaries of the Pale, the Anglo-Norman stronghold of Gaelic Ireland. It is rich in archaeological remains, particularly remains dating from the 12th to the 16th century. Within its boundaries stand the walled towns of Drogheda, which controlled a ford crossing the River Boyne, and Carlingford, which controlled Carlingford Lough and the coastal route round the Cooley Mountains. Dundalk was also a medieval town but very little of that period remains. Dundalk and Newry controlled the southern and northern approaches to the Gap of the North, which was the main inland route through the Cooley and South Armagh Mountains. This meant that every advancing or retreating army tended to burn both towns to deny their use to the enemy. Consequently there are very few old buildings in Dundalk or Newry. Dundalk is known to have had at least nine castles but one record states that the remains of 18 or 20 small ruinous castles and towers were removed in the middle of the 18th century. There are now no traces. Newry had several castles of which Bagenal’s Castle is the only remaining trace. On a previous tour we explored the area around Carlingford and the Cooley Peninsula. This time we decided to take two days exploring the rest of the county. We realised that it would be impossible to do an in-depth study in such a short period of time, so we selected about a dozen sites which were easily accessible. Some of these are well-known tourist attractions but several of them are off the beaten track. On the Saturday morning we gathered at the Carrickdale Hotel. Due to illness and family commitments our number had been reduced to eight. However such a small group is easy to manage and we drove in convoy (five cars) to our first site at the Hill of Faughart (J058127). Faughart is said to be the birthplace of Brigid, daughter of the chieftain, Dubtach, and the slave girl, Brocseach. Some sources claim that Brigid was born in Kildare and that both of her parents came from noble Christian Leinster families. She was born about 453 AD. The graveyard at Faughart is set within a semi-circular enclosure. Aerial photography has shown that this was surrounded by a large double-ditched enclosure. In the graveyard are the remains of a church, the west end of which may date from the 12th century. It was extended eastwards at a later date. The gravestones date mainly from the 18th and 19th century, but there is also the grave of Edward Bruce, who was killed at the Battle of Faughart on October 14 1318. Just two years before his death Bruce had crowned himself King of Ireland. Also in the graveyard is a circular mound with a well-formed kerb. This may be the foundation of a Round Tower. On top of the mound is the base of a High Cross. The monument is known as St Brigid’s Pillar. A short distance away is small annular bank with two large boulders marking an entrance. It has no clear function. Near the NE corner of the graveyard is a Holy Well with a very fine conical cover. The rag tree beside it is, unusually, a laurel (most rag trees are thorn). A short distance to the NW of the graveyard is an Anglo-Norman motte. It is surrounded by a ditch and is about 8m high. It was not explored on this occasion. On our way to our next major site we stopped at Bridgeacrin Church. This is a simple rectangular church with some interesting stained glass windows. One of these was designed by Michael Healey 1923 and features Doubting Thomas and Judith. It is a memorial to Thomas and Judith Treanor. Visually, Roche Castle (H991118) must be the most magnificent ancient structure in County Louth. It sits on top of a large limestone outcrop and dominates the surrounding countryside. It is said to have been built in 1236 by Lady Rohesia de Verdun, granddaughter of Bertram de Verdun. Stylistically it is of slightly later date and was probably built by her son, John, who died in 1274. Not all authorities agree with this. Rohesia is said to have promised herself in marriage to the architect if she liked the castle. However, when he came to claim her hand she had him thrown out, what is now called, the ‘murder window’. In 1464 the castle was noted as being ruinous when Richard Bellew obtained a grant to repair it. A hosting of all the English forces in Ireland took place in the castle in 1561. Cromwell is said to have demolished it in the 17th century. The castle has a magnificent double-towered gatehouse near the southern end of the east wall. The walls here are extremely thick. The gatehouse leads to a large bawn which is roughly triangular in shape. The curtain wall is built on the edge of the limestone cliff at all points except at the gatehouse where it is protected by a substantial rock-hewn ditch. This would have been originally spanned by a drawbridge but may now be crossed by a modern causeway. Inside, to the left of the gateway, is the ruin of a two-storey hall. The windows at the upper level have window-seats. At the north corner of the curtain wall there is a D-shaped tower with a vaulted basement. The curtain wall is well supplied with good crenellations and defensive loops. Just below the level of the wall walk is a row of small rectangular holes which evidently held posts to support a wooden platform. Even today, almost 800 years after it was built, Roche Castle is an impressive and awe-inspiring structure. Our next visit of the day was to Castletown Motte (N029083). The site is associated with the legendary hero Cu Chulainn but it was probably built by the de Verdun family in the late 12th century. This large circular steep-sided mound in about 10m high and 43m diameter at the top. It is surrounded by a deep and wide ditch and a substantial bank about 2m high. On top of the mound are the remains of a late18th century castellated house known as ‘Byrne’s Folly’. This was built by Captain Patrick Byrne, a well-known pirate, in 1780. The remains consist mainly of a four-storey crenellated tower with the rest of the house being reduced to foundation level. The house had a large hexagonal wing behind the tall tower and a small projecting round turret at the SE corner. The earthen bank around the edge of the top of the motte probably dates from Byrne’s time. A large amount of the motte was removed to construct the spiral driveway up the south face of the mound. About halfway along the driveway can be seen the entrance to a souterrain (now blocked). This consists of three drystone passages forming a Z shape. The total length is about 17m. There is a small D-shaped bailey at the NW of the motte but it is not very noticeable. The castle which stands a short distance NE of the motte was built about 1472 by Richard Bellew, probably on the site of an earlier de Verdun castle. It may originally have had a strong bawn wall. It is a large rectangular four-storey building with four substantial rectangular corner turrets. These rise for a further storey above the level of the wall walk. The original doorway was in the SE wall within the angle of the corner turret. It was protected by a murder-hole leading from the first floor. The castle is now part of a school and it is not possible to explore the interior. From published plans it is known that there is a spiral stairway within the south corner turret. These notes are compiled from published descriptions and from previous visits. On this occasion, however, due to a lapse of memory brought on by a good picnic lunch, we forgot to visit the castle. It is on our list for a future occasion. After lunch we went to the small village of Louth, which gives its name to the county. Despite its size it has several interesting ancient structures. At the NW edge of the village, in Priorstate townland (H956014), stands the ruin of St Mary’s Augustinian Priory, commonly called Louth Abbey. This was founded in 1148 by Donough O’Carroll on the site of an earlier monastery which was burned in that year. This priory was subsequently burned in 1152, 1160 and 1166. In 1315 the Prior of Louth was fined £40, but pardoned, for entertaining Edward Bruce and other Scottish enemies of the king. After the Suppression the priory and some of the lands were granted to Oliver Plunket, Baron of Louth. The ruins today date mainly from the 14th century with some later medieval additions. The church is about 47m long with the remains of three-light traceried window high up on the west gable, a large east window and four windows in the south wall of the chancel. The original north wall has been reduced to foundation level and replaced by a modern wall. There is evidence of a small tower at the NW corner. This may have held the stairwell. There are several later buttresses along the south wall. One of these almost encroaches on a leper’s squint. The graveyard has several interesting gravestones. One of these (now broken) is a cross-shaped stone with a high relief Crucifixion. A skull and crossbones surmounts the crucified figure. A short distance to the west of the priory is a small rectangular stone building. This is known as St Mochta’s House and is named after the founder of an early monastery who died in 534. The monastery was plundered by Vikings in 830 and 839. It was raided by the Irish several times in the 10th century and flattened by a storm in 986. It was burned at least six times during the 12th century. This little stone church probably dates from the second half of the 12th century. It is a rectangular building with a barrel vault over the lower storey. There is a simple west doorway and a small round-headed east window. There is a small ambry in the south wall. Above the chamber is another small chamber within the high-pitched roof. This has a pointed vault and is lit by a small east window. It is reached by a very narrow stone stairway within the wall, close to the NE corner. The building has been extensively repaired in modern times. A short distance to the SW of the village, in Artoney townland, is a motte. It is about 8m high and 11m diameter at the top. It is surrounded by a large, wide U-shaped ditch and a substantial outer bank about 2.5m high. It was not closely examined on this occasion. Dunmahon Castle (J036021) was built in the 15th or 16th century. In 1659 it was the residence of Henry Townley. It is a four-storey square tower with turrets projecting eastwards from the NE corner and northwards from the NW corner. The tower is now in a very dangerous condition with a large crack in the east wall. There are also some stones missing from the corners and the castle should be approached with caution. The doorway in the north wall is protected by a murder-hole leading from the first floor. Directly ahead is a barrel-vaulted room. It is lit by double-splayed loops in the east and west walls. The larger gap in the south wall may not be original size. A spiral stairway rises on the left, within the projecting turret, to roof level. There is a good drawbar socket to the right of the doorway. At the first floor, above the vault, there is a fireplace in the east wall. The chimney flue rises within the thickness of the wall to higher than the second floor where it is then carried on a corbelled projection. The insertion of this flue and the presence of the splayed loop at the lower level has probably contributed to the weakening of the east wall and the consequent occurrence of the large crack. There is a garderobe within the projecting turret in the NW corner of the first floor. There is a similar garderobe above it at the second floor and the latrine chutes lead downwards to a latrine pit at the base of the turret. The pit exits at the base of the north wall of the turret. The spiral stairway rises to roof level and it is possible to climb it. However, given the dangerous condition of the building, such an exploration is not recommended. There are good remains of crenellations. There is another castle a short distance from Dunmahon, at Haynestown (J043024). This is a small square tower with round projecting turrets at each corner. It is now completely inaccessible and much of the exterior detail is obscured by a thick covering of ivy. From published plans it is possible to see that it is a two-storey building with two ground floor rooms. The larger of these is vaulted. A spiral stairway rises in the SE turret. At the first floor level there is a fireplace in the north wall and a garderobe within the NW turret. We had some time to spare at the end of the day and we were able to view the exterior of Roodstown Castle (N996925). This is very similar to Dunmahon Castle, but in much better condition. It is four storeys high with projecting turrets at the NW and SE corners. It is vaulted above the ground floor. The doorway in the east wall is protected by a murder-hole leading from the first floor. A spiral stairway rises within the SE turret and there are garderobes at first and second floor levels within the NW turret. It was not possible to enter the castle on this occasion and these internal details are known from previous visits and published descriptions. On Sunday morning we gathered at Monasterboice Graveyard (O043821). This is the site of a monastery founded by St Buite who died in 521. According to the annals it still existed in 1122. The site contains the ruins of two 15th century churches, an almost-intact Round Tower, a monastic sundial, two complete High Crosses and fragments of two others. The finest structure within the graveyard is the South Cross. This is also known as Muiredach’s Cross due to an inscription at the bottom of the west face of the shaft which reads OR DO MUIREDACH LASNDERNAD IN CHROS ‘A prayer for Muiredach under whose auspices the cross was made’. Muiredach MacDomhnail, an abbot of Monasterboice died in 922 and the cross is usually dated to this time. Every surface of the cross is covered with high-relief carving. It is a mixture of biblical scenes, mythical beasts and curvilinear ornamentation. The cross stands 5.5m high. It has a pyramidal base and a pierced ring. The top stone is in the form of an early Irish wooden church, displaying crossed gable beams, antae and a shingled roof. Like most of the Scripture crosses the flat surfaces are divided into panels depicting scenes from the Old and New Testaments. The bottom panel on the east face of the shaft shows the Fall of Man and the Murder of Abel by Cain. Other panels on this side include Moses striking the rock and the Adoration of the Magi. The centre panel of the head of the cross shows Christ in Majesty at the Last Judgement. Crossed in front of Him He holds a flowering wand and a cross. Beneath the figure is St Michael weighing souls and a devil pulling on the scales from below. The Blessed are shown on the left arm of the cross and the Damned are shown on the right arm, being pushed by a devil armed with a trident. The bottom panel of the west face of the shaft shows the Arrest of Christ. He is shown standing between two armed men. He is dressed in clerical robes held together by a penannular brooch. The armed men have long droopy moustaches and long braided hair. Other panels on this side of the cross show Doubting Thomas and the Resurrection. The centre panel at the head of the cross shows the Crucifixion. The style of carving and the choice of motifs suggest that the same artist was responsible for Muiredach’s Cross, the Market Cross at Kells, Co Meath, the cross at Durrow Abbey, Co Offaly, and the Cross of the Scriptures, Clonmacnoise, Co Offaly. A short distance away is the West Cross or Tall Cross. It stands about 7m tall but the relatively small head makes it seem taller. It is also covered in carved panels but it is not as well preserved as the South Cross. The capstone again depicts an early Irish church but it is very worn. The lower part of the shaft has been badly damaged. Among the scenes shown are the Flight into Egypt, the Three Hebrew Children in the Fiery Furnace, Daniel in the Lions’ Den, the Sacrifice of Isaac, the Soldiers Guarding the Tomb, the Crucifixion and the Second Coming of Christ. Near the NE side of the graveyard a railing encloses the North Cross. This is fairly plain, with a Crucifixion on the west face and a roundel with 16 spirals on the east face. Most of the shaft is modern. Beside it is a portion of the shaft of a fourth cross. It has no decoration. Also within the railing is a medieval sundial. Near the west side of the graveyard is the Round Tower. This stands about 30m high. Only the cap is missing. The doorway, on the east side, is about 2m above present ground level. It has a round head and a double band of moulding extends down both sides. Above the doorway is a small angle headed window. About halfway up on the west side is a small square-headed window. The Round Tower may be climbed by internal ladders but the key to the door is no longer held locally. About 6km SW of Monasterboice stand the ruins of Mellifont Abbey (O013781). This was the first Cistercian abbey to be founded in Ireland. In 1142 St Malachy of Armagh brought a small number of monks with him from Clairvaux. Building began in 1157 and was completed about 1225. The abbey was burned in the early 14th century and partly rebuilt. The buildings follow the typical Cistercian plan. There was a large cruciform church with N and S aisles in the nave and east chapels in the transepts. The monastic buildings were arranged around the sides of the south cloister. For the most part the buildings have been reduced to foundation level, so the usual Cistercian outlay can be appreciated from the nearby high ground. The only building to survive more or less intact is the vaulted chapter house, which is situated in the east range. This was constructed about 1200 and was one of the most important buildings within the monastery. Within it was conducted the daily business of the monastery. A chapter from the rule of the order was read daily and this gave the name to the building. In Cistercian abbeys where the door to the chapter house has survived it is usually highly ornate to indicate how important the monks considered the building to be. Unfortunately the decorated doorway from Mellifont has not survived. A unique feature among Irish Cistercian abbeys projects northwards from the south range of the cloister. This is an octagonal two-storey building known as the lavabo. It had a circular vaulted ceiling and there is evidence that there was a wooden floor above this. The lower storey consists of an arcade of round arches with decorated pillars. Continental examples suggest that there may have been a fountain, surrounded by a circular basin, centrally placed within the lavabo. It was here that the monks washed after working in the fields. In 1494 the monastery was plundered by Irish nobles and in 1556 it was converted into a dwelling. On the hill overlooking the abbey is a small church known as St Bernard’s Chapel. This was originally a 15th century rectangular building with a south doorway. It was later given a small southern extension and a west doorway was opened. A cross-inscribed stone from the 12th century is now attached to the interior wall. It is greatly weathered. After lunch we went on a walking tour of Drogheda. Hugh de Lacy built a motte here at the end of the 12th century. Until the beginning of the 15th century there were two administrations on either side of the river. Both were walled in the 13th century. Drogheda was considered to be one of the most important medieval English towns in Ireland. In 1395 Richard II received the submission of the Gaelic chieftains in the Dominican friary where he held his court. Several parliaments were held there including one of 1494 which enacted Poynings’ Law which extended to Ireland ‘all statutes concerning the public weal made within the realm of England’. In 1649 Sir Arthur Aston held the town against Cromwell. It was stormed on September 10 and taken after the third assault. Cromwell slaughtered 2000 of the defenders and transported many of the survivors to Barbados. 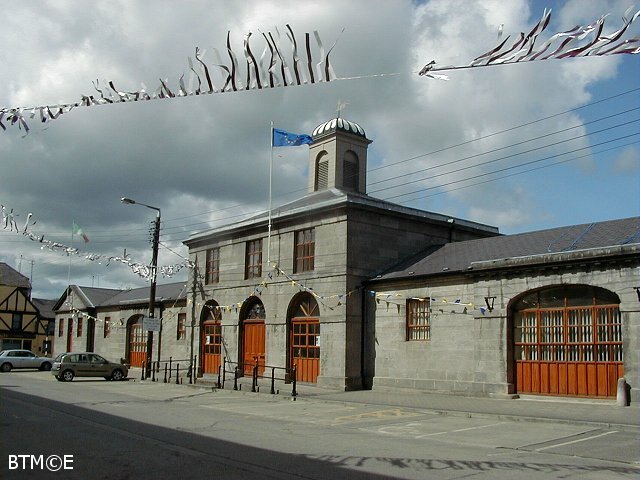 We parked in Fair Street beside the market house designed by Francis Johnston in the 18th century. It is a very fine building consisting of a three-bay two-storey central block. This is topped by a cupola with an agriculturally inspired weather vane. On either side of the block is a three-bay single-storey range with a wide central gateway. At either end is a gabled three-bay pavilion. These pavilions extend northwards for some distance and are joined by a wall, with a wide central gateway, at the northern end. There is another wide archway at the middle of each pavilion. It would seem that the inner wall of these pavilions originally consisted of an open arcade with round pillars. The gaps have now been built up but the round pillars remain. Fair Street joins Peter Street near the top and the view down Peter Street includes the Tholsel at the corner of West Street (now a bank) and, on the other side of the river, the huge mound at Mill Mount. This mound may have originally covered a passage tomb but was adapted for use as an Anglo-Norman motte in the 12th century to guard the bridge over the river. In later years a circular stone fort with a surrounding wall was built on top of the motte. This became known locally as the Cup and Saucer. In Georgian times the motte and bailey was surrounded by a strong wall and the bailey was covered by a military barracks. Most of these buildings remain intact and the fort on top of the motte has been rebuilt. In Peter Street stands St Peter’s Parish Church (COI). This is the second successor to the church in whose steeple Cromwell burned 100 defenders. The church was built in 1749 and the tower and spire added in 1792 by Francis Johnston. Along the east wall of the churchyard are erected the remains of a large tomb chest. The four sides of the tomb are inscribed and carved with coats of arms. The arms have been identified as those of Sir Edmond Goldyng and three of his wives, Elizabeth Flemyng, Blanche Cruce and Johanne Fynglasse. The tomb mensa has two cadaver effigies shown as partially decomposed bodies with the principal bones revealed. The effigies are enclosed in knotted shrouds which billow out to reveal the bodies. There is an inscription but no date. The stone may date from the early part of the 16th century. Although there is another stone with a single cadaver at Bewley, a short distance east of Drogheda, only about a dozen of such stones have been recorded in Ireland. Most of these are low relief carvings. At the east end of Laurence Street stands St Laurence’s Gate. This twin-towered structure is the barbican which stood outside the moat which surrounded the town wall and guarded the inner gateway. It was originally built in the 13th century and the top rebuilt in the 15th century. It stands four storeys high and consists of two round towers connected by a curtain wall pierced by an archway at ground level and several smaller openings at the upper levels. The towers may be climbed by stairways within the walls and are connected by straight stairways at the first and second floors within the thickness of the connecting wall. These connecting stairways are relatively modern. A short distance to the west of the barbican is a short section of the town wall. Drogheda had several gates which have now disappeared. Only St Lawrence’s Gate and the Butter Gate survive. That section of West Street known as Narrow West Street is the site of the West Gate. I believe there was also Fair Gate and Sunday’s Gate. St Fechin of Fore, who died in 664, founded a monastery at Termonfeckin (O142801). It was plundered by the Leinstermen and the Vikings in 1013, again in 1025 and finally in 1149. In 1144-8 Donchad O’Carroll founded a monastery here for the Augustinian Rule of Arrouaise. In this venture he was supported by St Malachy and Bishop Edan O’Kelly. At first the monastery was for both nuns and monks but by 1195 it seems to have been exclusively a nunnery. The church of St Fechin was later parochial and the conventual church was dedicated to St Mary. Some sources say that the convent was founded by the MacMahons but they were possibly benefactors in the 14th century. The last prioress was Mary Hubbard who was elected in 1535. She surrendered the priory in 1539 and was granted a pension of 26s 8d. A report in 1540 indicated that a pension of 26s 8d was granted to Margaret Harte and 13s 4d granted to Anne Gedon. In 1541 the ancient church and two other buildings were reported to be in a ruinous state. The property was leased to Catherine Bruton in 1578. No traces of buildings from any of the monastic phases survive. The High Cross is the main relic of monastic times. It is a sandstone cross with a ringed head and a church-shaped capstone. It stands on an undecorated semispherical base. On the east face there is a Crucifixion with a lancebearer and spongebearer. On the west face is the Last Judgement with Christ in Glory. The rest of the cross is covered with panels of fretwork, interlace and spiral ornament. One panel on the east face of the shaft features snakes and a dragon in combat. While much of the carving is clear and in good condition some of the finer work is obscured by weathering. To appreciate the motifs used it is best to view the modern copy of the cross which stands as a gravemarker to the north of the present church. At the base of the cross is a small sandstone slab covered with a weathered Crucifixion. A short distance away is the base of a small granite cross. This has a roughly rectangular base and a roughly circular top. Each face is carved with an open panel. The graveyard contains stones from several denominations. The older part of the graveyard lies to the south of the church. There are many good 18th and 19th century stones. At least two of these are carved with a Nativity scene. Another stone shows Christ carrying the cross to Golgotha. Termonfeckin Castle (O143803) is a small three-storeyed 15th or 16th century tower-house with some unusual features. The present doorway, at the north corner, which appears to date from the earliest times, does not lead directly into the castle. It leads to a small bawn along the NW wall of the tower. The outer wall of the bawn is a modern rebuild. Two doorways lead from the bawn inside the tower. The main doorway leads to a barrel-vaulted room at the ground floor. It is lit by a small splayed loop in the SW wall. Beyond this room is a small rectangular chamber with a flat vault. It is lit by a small loop in the SE wall. A spiral stairway rises in the north corner of the castle. This may be accessed through the second doorway leading from the bawn. At the first floor there is another large room with a fireplace in the east corner. A small rectangular room leads off the SE of the main room. The section of the castle which houses these two small rectangular rooms does not continue above this level. This part seems to be an addition to the castle but it was probably added no later than the 16th century. A garderobe leads off the main first floor room at the south corner. Above this, at second floor level, is another garderobe. The wooden floor of the third storey is now missing but above the main room is a loft with a corbelled vault. Corbelling is common in the smaller chambers of many castles but this is the only example of such a large corbelled vault in an Irish castle. The spiral stairway continues to roof level where there are good crenellations. There are caphouses on top of both the north and south corners. When the castle was first built a turret projected at the south corner beyond the SE wall. When the addition was built at the SE wall this projection is only evident above the second storey. The castle was repaired by Captain Brabazon in 1641. It is said to have had a bawn with a rounded turret but these have disappeared. The notes here are a mixture of personal observation and information gleaned from published sources. The following books provided useful information.